When parents are first told that there might be a problem with their child’s brain or nerves, most are hopeful that with hard work and the right help there will be improvement. Young parents are game to try just about anything if it holds the tiniest shred of hope for their child. Over time, this optimism fades and most people start to adjust their expectations downwards. The exciting early gains in function are gradually replaced by smaller accomplishments that seem to take longer to achieve. Life gets more complicated and school demands grow yearly. Orthopedic surgery to correct malalignment is often booked for later childhood and it is hard for parents to avoid thinking of this painful event as a failure…wasn’t all the therapy and home stretching and exercises supposed to avoid this outcome? Surely we haven’t had Botox injections every 6 to 9 months for nothing? In my experience, most parents are pretty tired out and discouraged by the time their child is entering puberty. Living with a teenager is difficult at the best of times and any chronic medical or neurological condition complicates the picture. Lowering their expectations for change is completely understandable and completely wrong! Up until this point, the child has been a pretty passive partner in the whole rehabilitative focus. Going to therapy is part of their life. Most children develop a good relationship with their therapists and are cooperative. But, they are children and have very little concept of long-term goals or how well they are doing compared to the parents’ goals of improvement. Puberty changes all that. As you can see in the diagram, at this age the child wants more. They want to be like their peers. They want to wear high heels. They want to take part in sports. 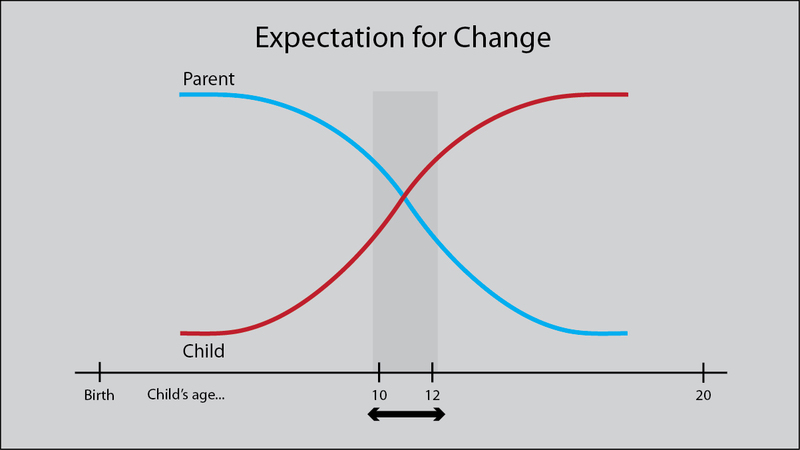 But these two competing pressures, of the parent to adjust their expectations downwards and the preteen adjusting their demands upward, creates a perfect storm. There is good news and there is bad news. First the bad news. In puberty, the child enters their second biggest growth spurt. At this time, all of the things that we do to delay or avoid malalignment have to be increased, not decreased. Many who have avoided a primary surgery, will now need orthopedic surgery. Bad biomechanics have to be corrected if you want an improvement in movement possibilities. The good news is that they also have a second major spurt of brain neuroplasticity. It has been estimated that teens gain an extra 40% of brainpower during this tumultuous time. Their brains are motivated for change and it is time to do new things and to do them in intensively. The teen years demand an entirely new approach to pediatric neurorehabilitation. It is not “Good Enough” to do more of the same harder. The first step is recognizing that we have to throw out complacency, shake up the whole picture, and get set for a summer of change. More on this topic next week. In the meantime, please read or re-read these links. I feel my expectations starting to slip. It is easy to say not to give up, however, after spending hours every single day since birth doing therapy with my son for so many years and gaining next to nothing (he can’t sit, roll, reach, or hold his head up) sometimes parents are not “giving up” but just realizing that their child is not going to change significantly and they love and accept them as such. We continue now to stretch, to do exercises, but I no longer spend my whole life with PT, OT, speech, vision, communication and feeding therapy. Please be careful not to shame parents who invested so much for so long. Shaming anyone was not my intention and I apologize for that misunderstanding. Your perspective is important. There is no point in continuing therapies that just do not work. I think your choice of what to continue is correct. In the stretching program, a bed size massage heating pad…available on many massage websites…is a good investment. Warming the tight muscles before you stretch makes the process more effective and easier on the child. As he grows bigger, I advise getting a home care evaluation from an adult OT who deals with adults with severe brain injury. There is equipment that can really help preserve your health and importantly, your back. The insurance claim for this type of help usually comes from your adult MD for your health. Sadly, there’s a tendency for services and therapies to be cut right around this age, and it’s really hard to find private therapists who do effective work with bigger, heavier kids, particularly those who are more profoundly involved. I’ve not given up, nor do I consider my son’s current condition good enough. My motivation is high, because I see very clearly what even some small gains in function could buy him in terms of quality of life– something that was harder to envision when he was little and light weight. However, to some, I probably look like a complacent mom who’s pulling back and giving up. I’m over 50 and getting older every day (to be expected). He’s 95 pounds, and getting longer, heavier, and stiffer every day (also pretty much a given). The day when I can no longer lift him is not that far off. The choices we make every day are agonizing, and they’re often not driven my beliefs but by the nitty gritty pragmatics. We can’t hire a caregiver willing to do such hard work for what DSHS will pay. We’re limited in our therapy choices by so many things — insurance coverage, geography, time, our failing equipment ( outgrown wheelchair, aging ramp van). Layer our diminishing ability to do it all with the school system proposing cuts to his therapy services and the insurance company ready to pounce if he fails to progress– it’s pretty depressing. Thank you for your perspective. It is an important one and one that is often missed. I agree that the older, heavier teen to young adult is often left behind. Some practical suggestions. Ask your own physician to arrange a home care evaluation of what you need in the home to manage, without damaging your back or the health of the others in the house. There are techniques and technologies available to an adult coming home with a severe head injury that can be very helpful. Have his doctor certify that the van is needed, the chair needs replacing, etc. It will be a fight with insurance, but more backup, from as many directions as possible, can help. Ask your insurance program if they have a case manager available. Many do, as it eventually saves them money with more efficient care.